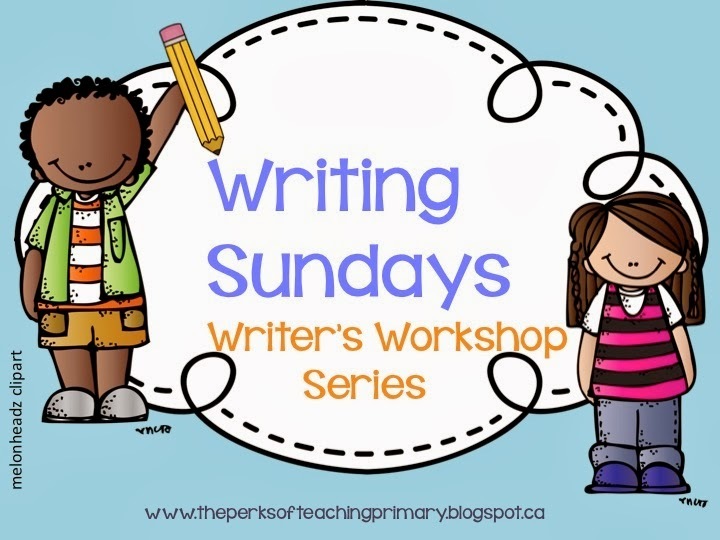 Writing Sundays #6 : Mo Wilems is not BORING! First off, let me tell you that this edition of Writing Sundays will be short but sweet. Why? Two words: Parent Conferences. I’ll even throw out two more: Grand Opening. We spent the week planning and preparing for conferences and rehearsing and decorating for our school Grand Opening. Oh… and 1 more set of 2 words: Professional Development day. I shared with staff about Mindup and Superflex as a social learning combination that really works! I’m glad I have such a chill staff. They really were active with sharing together, asking questions and adding to the conversation. Phew… what a week. I’ll bet you all are feeling the same. Is it just me or is this year spinning…? 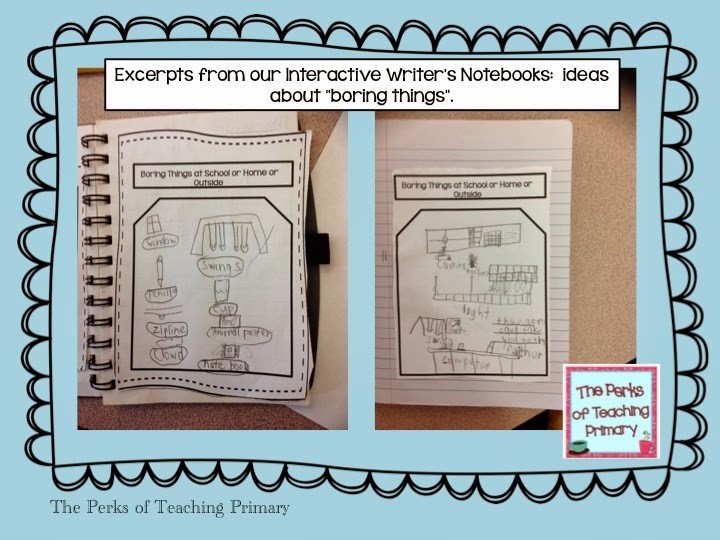 Last week we worked in our Interactive Writer’s Notebooks and I thought I’d share our thoughts about boring things. We read Nothing Ever Happens on 90th Street. The students loved it! It is a great book to introduce ways to get ideas for writing and it is perfect for older students too! After we read it, I pointed up to the new projector that was installed and asked what it was. I then said, but “what if it was actually a time traveling machine” and I turned it on to see a green screen. Well…..what a conversation ensued after that!! I kept saying, “and then…” and I’d call on another student. Eventually, we came back around to the projector and some kids noticed that it was just like a “circular story” like Laura Numeroff writes in her “If you give a…” series. Brilliant! Way to go 1st grade teachers! The transfer of knowledge and connections have begun! I introduced Mo Wilems to the class this week as our new author for Author Studies. He needed no introduction! 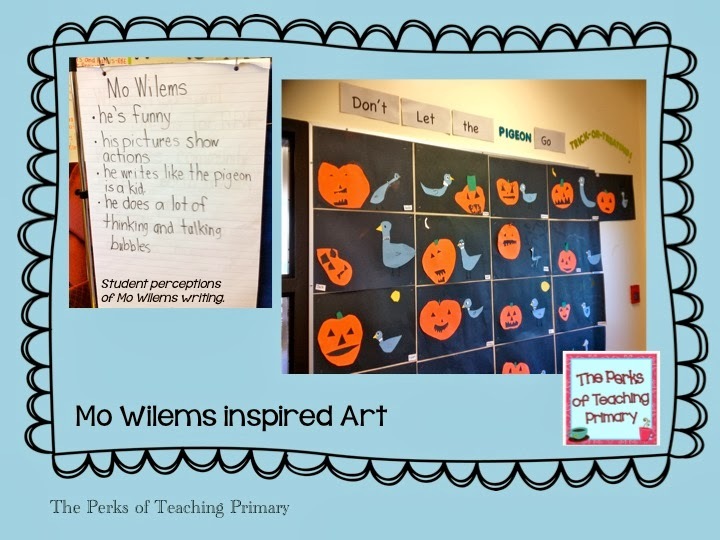 The kids love Mo Wilems and I’m sure yours do too! Mo Wilems is not boring! His stories come across as very simple but they have a lot going on! I asked the students about some of the things Mo Wilems does in his stories after I read “Don’t Let the Pigeon Drive the Bus” and we generated a simple list. Then I read an “Elephant and Piggie” story and re-read the list and asked if it still applied. (If it didn’t, it could not be considered a constant trait of that author). You will notice in the list that it is a random list. As they spoke, I wrote what they said but paraphrased it verbally using the 6 Traits language. Soon, students will be asked to pick a dominant trait/s of the author and *then* give examples of that trait from the story that show this trait. That’s it for my week! How was your week? Love all these ideas Shelley especially the list your students came up with. Combining the Pigeon and Trick or Treating is awesome. You must be so relieved that Parent Conferences are over. Mine are coming up soon…and my year is spinning too. Have a great week!